Our Stainless Steel Blank made from high quality carbon and stainless steel. The type of Stainless Steel Blank are with grade AISI 304, 304L, 304H, 304N, 304LN, 309S, 309H, 309Cb, 309 HCb, 310S, 310H, 310Cb, 310 HCb 316, 316L, 316H, 316N, 316LN, 317, 317L, 321, 321H, 347, 347H, 347LN, 348, 348H, 904, 904L etc. Stainless steel blanks, steel blank, carbon steel blanks are available in different grades conforming to international standards. These blanks are offered at industry's leading rates. Our organization is engaged in offering a comprehensive range of Metal Sheet Blanking in variety of sizes. These plates are highly durable which allows hassle free functioning at client’s end.These plates are light in weight, easy to use, and available in various sizes. MILIPORE TYPE MEMBRANE FILTER HOLDER LANK GLASS PART WITH STAINLESS STEEL SCREEN FITTING, (REMOVABLE). 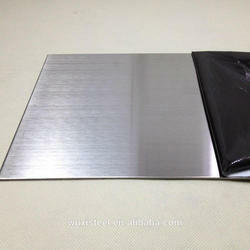 We are offering Stainless Steel Blanks to our clients. We are offering Alloy Steel Blank to our clients. Amidst our wide range of products, we are also engaged in offering a superior quality Square SS Patta.